Pressure testing is used to determine the integrity of a component. Where cylinder heads or blocks are suspected of having internal cracks or porosity the castings can be tested to find faults invisible to other means. Problems uncovered during the test stage can save considerable time and money which might otherwise be invested in repairing a faulty component. 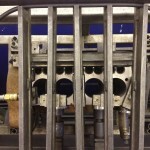 Cylinder Heads and Blocks to be tested are first of all stripped completely to give full access to all surfaces where coolant passes through the casting. 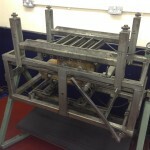 The casting is then mounted on our dedicated DELTA pressure testing rig where initially all the coolant passages in the gasket surface are blanked off using metal cased rubber pads. One of these will include a special adaptor carrying the air inlet. The lower section of the test rig is then raised using a lever and cam arrangement so that the casting under test is compressed so sealing off the coolant passages. Next, any additional coolant passages in the sides and/or ends of the casting are also sealed using purpose designed clamps. Once sealed the casting is ready to test. Compressed air is introduced via the air inlet at pressures of up to 60psi. Once pressurized, a valve is operated to close off the air supply and a gauge indicates the pressure held within the casting. The test is conducted over a period of time during which the pressure is monitored. If all is well the pressure within the casting will remain constant and the job will pass test. 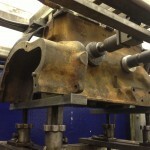 However should there be any leakage, the pressure inside the casting will drop which will be indicted on the gauge. At this point tests can be conducted to establish the cause of the leak. We can rotate the component through 360° and use a bubble solution as a leak detector. Leaks will show up instantly as a frothing around the affected area. Once a leak is established we can offer advice on possible repair solutions. Depending on suitability, pressure testing can sometimes be carried out hot using either warm air to heat the casting externally or by introducing warm water to heat it internally. We can test almost any head and block type including commercials, V6, V8, side valve; even oil coolers and EGR valves.